Since I did the Oops and don't have an artist featured this week, I decided to tell you of all the joys of my collection of art that wasn't or used to was but isn't now. HUH? I adore junk store, thrift store, second hand store shopping. I have been recycling and redoing for more years than most of you are....you lucky ducky youngsters you. One of my favortie things is to find paintings and reclaim them for more advanced "arting", mixed media or embellishment extravaganzas. None of these paintings are what I would call bad art, they are just not polished or ever been in a judged show kinda art.....and that is what makes me love them. They deserve adoration too. 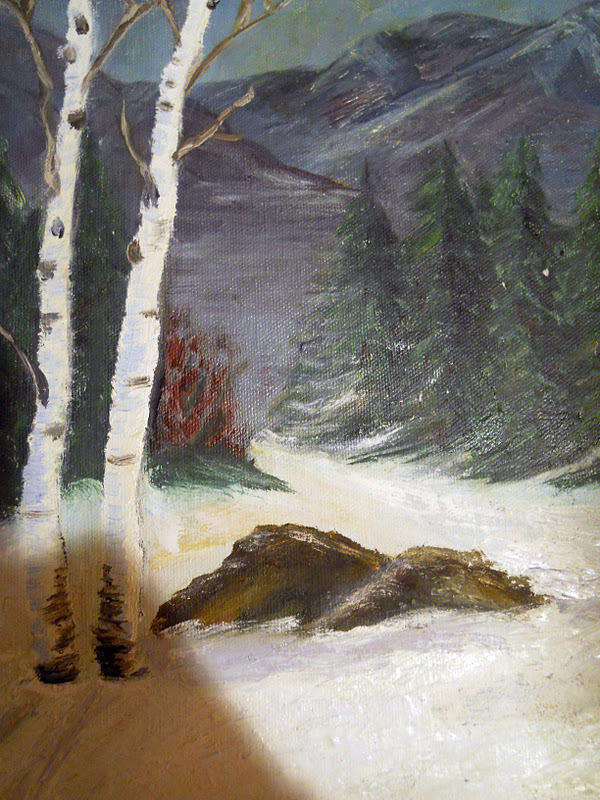 I love to find winter scenes and play sparkle plenty with snow glitter, icicles and the old standby mica glitter. 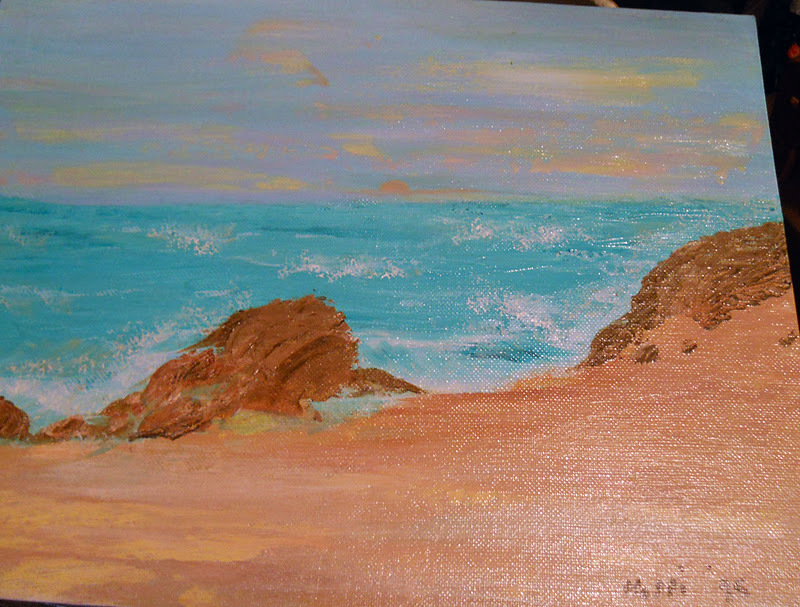 I also adore sea scenes where I can place mermaids and crab on the sand with shells and pebbles. But last week while shopping at GW imports as we call it at our house (goodwill for the uninitiated) we found a diamond in the rough of epoch proportion. This is the bestest of the best, the cream de la creme. The painting is of a rural setting house with barn and it features a full moon through the trees. Now the artist could not have known my redo art aesthetic any better than if the mysterious Carol (bless you darling who ever you are) had asked me what I would like to see in a painting for my hallway. For you see it reminds me of a project I had in "Kiddie Art 212" in college. We had to take a page from a childrens book and make it a mixed media translation of the original. I chose a book titled, Nothing ever happens on my street" and made a 4 season folliage change to the trees etc. What fun. 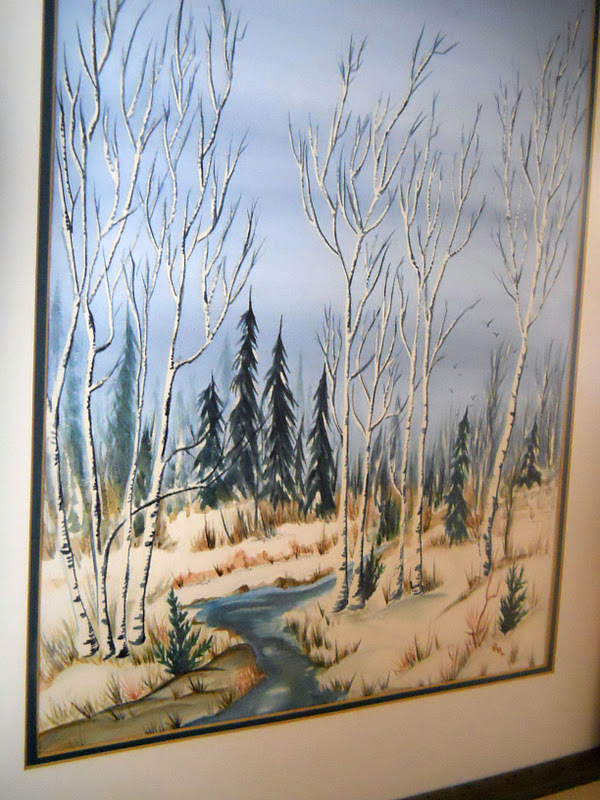 And this painting is offering some of the same kind of giggles and grins.....see the pathway? I wonder what will be coming down the path this month versus, oh say in the fall. 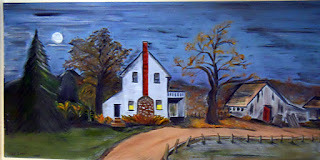 The painting is large enough to be quite striking, about 20 x 40. I'm thinking about magnets for the changes, since this is not framed. I have enlisted the imaginations of all the big and little ones at our house to tell me what we need to make this a seasonal masterpiece that we pass several times a day. What do you think? Have any ideas to share? What a great, fun idea! Be sure to put something with googly eyes on the painting. There is nothing that cannot be improved by googly eyes. And "GW Imports" -- LOL! Oooh, very cool, and love the idea of using magneted additions for the season! Linda, you are way to smart! 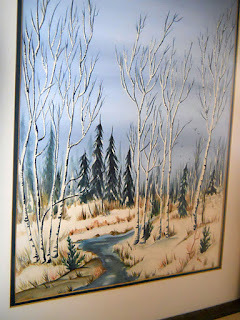 I have to go to GW Imports more often ;o) All these paintings are fantastic, but the last one, really tops them all! How about making little people on magnets to go along the path? You could have them for Halloween. Or have fairies in the sky? Have fun! Can't wait to see what you do!! Hey, I would be honored to be featured on your blog!!! Thank you so much, you're such a sweet heart to me!!! I agree, orphan art is the best! I love imagining who painted them and what inspired the piece. :) I think that's fantastic that you guys have so much fun giving them a new life. Perhaps you need the Circus to come to town and march down the path in the last one?